Reusable steps can be used to create a group of steps which are common among a lot of test cases as they are without any modifications. Using reusable steps helps you in saving redundancy and time in test case creation process. Please note that as of Test Collab version 1.14.2 , reusable steps can only be used when "Markdown" is selected as editor type in "General Settings". 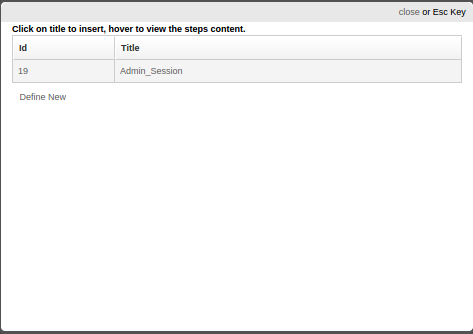 When an authorized user opts to add a set of reusable steps, then a form will be shown to enter information. To provide the properties (format) for text being used for each step, user will have set of icons associated with the text editor. Both title and steps are mandatory fields. When an authorized user opts to edit a set of reusable steps, then a form similar to add new set will be shown and user can update any of the information. The reusable steps' list screen, lets an authorized user manage the reusable steps. On this screen, a button to add a new set of reusable steps, a list of pre-existing sets of reusable steps will be shown. icon on toolbar of text editor. When the icon is clicked user gets list of set of reusable steps to embed. User can also define new reusable steps from this screen.